While historical or real-time events are indicative of what could happen, a probabilistic risk assessment provides a more complete view of the probability of experiencing extreme events and damage. Kinetic Analysis Corporation uses the same suite of models for both real-time and probabilistic hazard assessments and damage estimation. Exceedance probability curves can be based solely on the historical record or, if low probability events are of particular interest, on a stochastic catalog of events. Exceedance probabilities are available for all regions of the world. 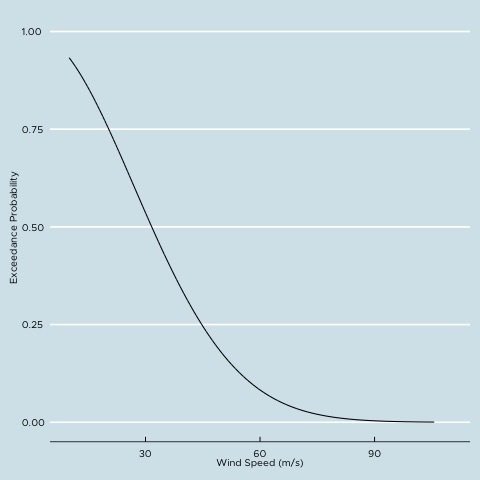 Kinetic Analysis Corporation offers annual and occurrence probability of exceedance curves for the intensity of wind, wave and storm surge from tropical cyclones. The units for hazard intensity can be customized for a client. For example, winds can be provided as 10-minute or 1-minute sustained winds or as gusts over a specified time at 10 m height in open terrain. Consistent with our multi-model approach, winds, waves and storm surge return period can be generated using a variety of models. Consistent with Kinanco’s multi-model, global approach we offer exceedance probabilities for damage ratios based on eight damage function families for any location and a wide range of asset classes. Structural damage functions account for damage due to tropical cyclone winds and tropical cyclone-generated storm surge and waves. When there is damage to the envelope of a structure, damage its contents is also estimated. Damage ratio exceedance probabilities are available for variety of high-level asset classes. In addition, we can provide damage ratios for selected client-specific asset classes.